I thought I was finished posting cards earlier today but I had time to squeeze in one more challenge card for the Mod Squad DIY challenge to make your own background. I started off with a piece of long-retired glossy cardstock from SU! and stamped it in Versamark ink with a polka dot background stamp then heat-embossed it with white ep. I sponged in pale colors of blue, pink, yellow, green & lavender inks randomly. Next I die cut the SSS Hearts Parade die from heavy yellow cardstock, along with assorted dsp snippets and put them all together to make a fun focal point. 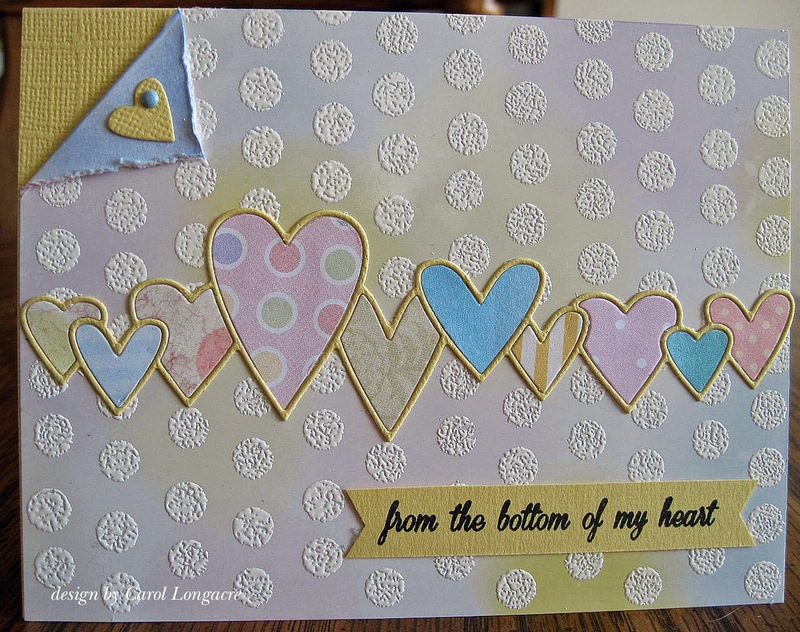 I turned down one corner, adding a die cut heart and a mini brad, and stamped the sentiment on coordinating cardstock. I just love this row of hearts with all the different colors and designs! This qualifies for another contribution to the Snippets Playground #119, so I'll be taking it over there too! Thanks again for stopping by, and make it a great evening! Great job with this very pretty background. Love all those hearts and that perfect sentiment. Have a good night. Very cool bg and lovely hearts. Your card is wonderful - so glad you got to make several things this weekend! Hugz! Slow work to cut and insert each heart back in the die...but so well worth it...Cuz it looks wonderful! Very pretty card! Love the light sponging on the background you created and yes....the heart are marvelous! Love the different patterned papers you used in them. I love that wonderful row of hearts, Carol. The turned down corner with the tiny heart is really nice, too. Very pretty card!!! How absolutely fabulous, Carol! I LOVE those hearts. LOVE the dots.. the sweet little turned down corner. What a darling card! Nice Carol. Geese Louise you've been busy or I have been sleeping. I missed a whole train load of super cards. Good lord. You're good. Great way to make a background, Carol, I bet it was also fun to use all those great teachniques...for this well done card! Oh you did it again Carol - another amazing card using snippets so, so well! I do love the row of hearts and turned down corner - and of course your lovely background too. Cool background, and I LOVE those hearts!! Fabulous card, I love the hearts and the embossed dots. More amazing work, my friend! I just sat and stared at this beauty! You add such lovely bits to your die cuts. Very pretty. I like the inlays you've put back into your card, a nice assortment of colors.